I am sorry to learn of your banning. I actually liked to read some of your stuff! Ok, ok, it's not like we agreed on several points. That doesn't matter, if we all agreed all of the time we would not have a reason to converse. I think your banning was a big mistake, when I saw it under your name I momentarily stopped breathing...I was pretty shocked. Yeast and flour don't raise my anxiety level nearly as much as these theological concerns. That's pretty much all it takes to pass as a "Byzantine Catholic" in most parts of the Internet these days. yes, I posted this as a test to verify the draconian measures being made there. I too received my banishment notice upon attempting re-log in 30 minutes later. And my account still does not note "Banned"
I quoted you and then saved it without replying. Doh. I feel like a fish out of water here. I will continue to post here so long as I as I can do so peacefully despite my firm Roman indoctrination. I had let my passions rob me of that over there way to often. Prior to being banned I felt a need to withdraw some too but in my compulsion I ignored it. Thanks and I always found your posts very charitable and I suppose that's why your still there and most of us are not. I can't deny having a hardened heart. I've even been known to get snippy with the Lord Himself. I could be laying in a ditch and still proud of myself some how. You know what they say about pride, it always proceeds a fall. Thank God for God and that He is always Faithful to us despite ourselves. I honestly think most Roman Catholics are ignorant of Eastern Praxis. I know I was just a few short months ago when I first barged into those threads. They need to be educated peacefully because most of us will naturally want to Latinize the East because we know no better. Through exploration of the issues in the old threads I slowly came to realize there is no need. But it took that education to do so and now I can honestly respect Eastern praxis. I see the Eastern Catholics as building that bridge too. I actually found myself defending against notions of latinizations with other Roman Catholics trying to help them realize the same thing. Then I arrogantly made a point about the old thread to rub it in and am paying the consequences. It's harsh but it was my mistake. As hard as it is to swallow, the moderator was fair in defending the rules against me as well as others. I often push God into a corner so to speak. I sometimes don't recognize His will until I have no other alternatives. Then when that time comes all I can do is resign myself to this road block and try and do better to follow His will in the future. It has led me here and another forum that seems like it may be exciting as its extremely ecumenical with allot of sincere believers with sincere questions about both eastern and western Churches that I can answer. Not only that but its GUI is set up even better than CAF. I have only made a few posts there as of yet but so far haven't encountered any anti-Catholic/Orthodox propaganda, only lack of understanding with ears willing to hear. After spending allot of time on CARM I did not expect to encountering many folks from other belief systems who are charitable about it and willing to honestly hear a different perspective which encourages me. If you or anyone think you might be interested in helping to build bridges there from time to time, PM me and I will send you the site name. It is about twice the size (or more) of CAF with many many more theological topics to choose from. Fr. A. I think you would have fun there too if your ever bored. There are many Orthodox there. P.S. Please don't think I am encouraging anyone to leave here or have any criticism of this forum at all because I do not. I am not even recommending the other one with any opinion as I haven't been there yet but 2 days. I just feel this call and see a need for smart people like yourselves that could be very efficacious for all in reaching out over there from time to time as a sort of experience to broaden the mind through the experiences of others unlike ourselves. Well from what I managed to see on the Essence and Energies thread tonight there will be very few folk of any stripe before long. This is how most if not all those who got canned got it. No warning, no PM'ing to let us know why it was done. Just whack and it was all over. I see not showing banned under the name as misleading. I may have benifited from knowing what you were banned for. I fell into the same stiff rule. At least the rule had been created for a day after I got hit with it. Welcome to all the new bannees/refugees from CAF!!! Pretty soon, CAF just won't even be worth logging onto (he said, with tongue firmly in cheek!). I sent you the following message last week, and have yet to receive a reply. I wonder if someone there would show me the courtesy and decency of sending me a meaningful reply? We'll see. I ain't holdin' my breath! I see that paradoxy got axed and she must have been a real pain LOL because she has banned under her name. Sorry, the comment was totally tongue in cheek, as I can't fathom why she was banned, let alone why such a lady merited such "special" treatment. I have split off a post from this thread and moved it to the Moderator's Forum. The reason I have done so is to allow us time to consider the legal implications of the post. Basically, the post which was removed accuses specific people on CAF as well as CAF corporately of breaking the law. First of all, in our judicial systems in the US, Australia and NZ, a court is required to determine whether someone has broken the law. Our judicial systems assume innocence until guilt is proven. While it is certainly acceptable that questions be asked as to whether certain actions are legal or not, only the judicial system can determine guilt or innocence or determine that a case is proven or not proven. To make statements to the effect that someone has indeed broken the law based solely on one's personal opinion constitutes both libel and contempt of court. Removing the post is meant to protect the poster, and the board from any legal repercussions. Please be more careful about what you say publicly, as there could be legal ramifications for you. That seems like a pretty sane and sound response to me. I took a post of the old Hesychists-are-ditheists of that thread, along the response to your post to this basically telling you "if you can't stand the heat...."
I started a new thread in Apologetics (I meant NCR, but was helping my son with his homework are missed where I put it) and post it. The thread was locked within 5 minutes, with a post (and link) that it was a duplicate thread, and the link led back to ECath. My response wasn't moved, though. I thought you were encouraged to take certain topics over to Apologetics? It's funny, I was thinking of you when I put it up today...no kidding! We've had ourselves a ball o' fun a time or two, haven't we? I suspect that Joe's viewpoint on the usage isn't precedent any longer. Too bad he never codified the EC rules, since the ones he wrote for much of the rest of the site (like the banned topics list and the discussion rules in NCR which - altho they don't any longer have his name on them - are pretty much a verbatim copy of the ones he put out back when EO was an NCR subforum under him) seemed to have survived his "resignation" - at least for the moment. "Sock puppetry" is registering under another name. Please do not give advice which you are not authorized to give. If the moderators of CAF have said so, then could you please provide evidence, otherwise do not presume anything. I think you are all being tested. We follow Him Who said: "Love your enemies, bless those who curse you, do good to those who hate you, and pray for those who spitefully use you and persecute you." Let's not give in when the test comes and someone abuses us! God allows such things in order to separate the solid wheat (which lives His words) from the empty chaff (which just gives lip service to His words). Stick with the wheat and keep your eyes fixed on Christ, "Whose winnowing fan is in His Hand, and He shall thoroughly purge His floor". Umm. No they're not:"Sock puppetry" is registering under another name. Actually, CAF permits multiple nicks - one of the few fora which do so. In its banned topics list, it has a specific definition of "sock puppetry" as a prohibited practice. so, the banned practice is, basically, the literal sock puppet technique of talking to - or arguing with - oneself (or in support of ones own viewpoint), using another identity. Oh well, give it a go then. I was having problems earlier while Robert was on (which usually means he's tinkering with the site as our technical wizard), but I'm not having any trouble now. If you are still experiencing difficulties, start a thread in board news. The last 12 hours for me. Pages simply refuse to finish loading. I have suddenly found myself in a strange dilemma. I suppose I was benign enough to not get banned at CAF. But now I cannot join the banned club. I am a misfit! Ah, but I still have Michael (Hesychios). If there was a smiley that rolled around laughing, I would have posted it here. 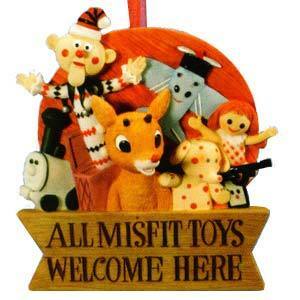 Welcome to the island of misfit toys! Tried it but got the same response as Irish Hermit. leaving just the scarelet letter LOL. Pretty meaningful and detailed, no ? Thank you for your reply. It was, however, hardly meaningful, and doesn't answer the questions I asked in my original post. My concern is for the disingenuousness and, to put it bluntly, dishonesty involved in the "banning" of me and my fellow Orthodox Catholic Christians. I know you are busy, but can you not take a few moments of your time to address this important issue? Please see the information at the link above. " (I deactivated, I think, her link--you know what to do). Thank you for the link. However, it still really does not address the issue or my questions. Why is it that I get the feeling that you at CAF are trying very hard to avoid the controversy that has been stirred up by freezing the accounts of (i.e. banning)so many Orthodox Catholic Christians from CAF? Even the statement posted in the link you supplied is terribly misleading. You say "...we can ban him privately so that a public stir is not created and so that he can retain the dignity of appearing to have stopped participating of his own volition...", but the fact of the matter is that a)a public stir has been created, and b)neither I nor any of my fellow "bannees" from CAF stopped participating of our own volition. To set things up to give the appearance of something that is the direct opposite of reality is....well, I'll let you fill in the blank. I am not the smartest person in the world, but even I can recognize such blatant dishonesty. What dignity have any of us who have been banned retained? We cannot even pm other members or post messages that stay up for more than 30-60 minutes to plead our case! We have had no recourse to any kind of appeal mechanism. And you have hoodwinked a large number of your members by your actions, which bring to mind a word familiar to many Russians and other Eastern Europeans--"purge". You guys won't even discuss with us your actions, and even though it is CAF "policy", when what you have done has been on such a large scale, that "policy" becomes an ever-so-convenient curtain to hide behind. How honest is that? I don't pretend to speak for others, but I would only ask of you the following: candor, honesty, decency in your dealings with others, a willingness to openly discuss a difficult issue, and a modicum of Christian Charity. Am I asking too much? I certainly hope not, unless the people at CAF are not what they purport to be. I'm sorry if I sound harsh, but this is nothing compared to the harshness with which I and my fellows have been treated by CAF, most of us for really no good reason at all. At least no good reason that was ever explained to us in any kind of meaningful manner. I sincerely hope that you will take all of this to heart, and find the willingness and compassion within your own heart to discuss this openly and meaningfully with me or anyone else of those who have been banned. I look forward to your comments as soon as you are able. We're having a really deep, meaningful conversation, aren't we ? At least it fills in some of the slow spots in my day . I'm sorry that the information I've provided does not satisfy your concerns, but that is all I have to offer to you on the topic. Please do not email me about this subject again. Thank you for your understanding and cooperation in bringing this discussion to a close. God bless. End of "discussion". I didn't really expect more than that, but just had to at least try.